Manchester City's Premier League title defence will be challenged from multiple directions as nobody is ready to miss any point, according to Pep Guardiola who claimed that Manchester United and Chelsea could still be in the hunt for the Premier League Title. Man City travelled to Everton on Wednesday, for a match that has been moved forward due to their participation in the Carabao Cup final later this month. The Manchester Club had a victory as the win gave them a move above the Premier League leaders Liverpool on goal difference. Jurgen Klopp's led Liverpool team failed to capitalise on City's 2-1 loss at Newcastle United last week as they were held to a back-to-back 1-1 draws with Leicester City and West Ham in the case. While Pep Guardiola's men returned to their winning ways by seeing off Arsenal 3-1 at the Etihad Stadium on Sunday. 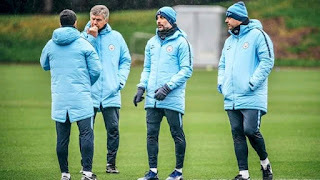 But Guardiola feels the amount of points left to play for means other horses could enter the race of winning the trophy, after casting a particular glance across town to Ole Gunnar Solskjaer's restructured Man United. "I never said Tottenham are not there. "I never put out [of the race] all five or six teams and United is making this run of victories every single week. They will be there to fight for the Premier League. "We see the table and see the first two or three and say, 'they are able to be champions' and we don't look further than that. If Chelsea win games in a row they will be a contender too to win the Premier League. "Everybody is there. The gap is not too big. With 39 points to play for, nine or 10 points behind is not too much. Seeing the Premier League now, everybody is ready to take points.